For years, Luke Elliot has been a respected businessman. But he’s had a secret life no one knows, and he’s given that up to settle down completely. But when tragedy tears his world apart, he flees in despair from anything that could evoke painful memories for a fresh start in another part of the country. And there he meets the beautiful and mysterious Jessica Morrow, who is also trying to escape from a past she can’t face. As they become close, and Luke finally learns her backstory, he realizes their fateful meeting could end up getting both of them killed. Paths that began in Chicago and San Diego, with stops along the way in Santa Fe and Philadelphia, converge in Seattle, where a deadly cat-and-mouse game ensues, forcing Luke to call upon his lethal skills once more to save himself and the woman he loves. 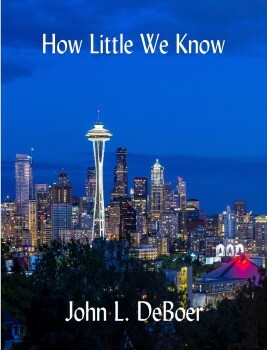 HOW LITTLE WE KNOW is available from Amazon. After graduating from the University of Vermont College of Medicine, John L. DeBoer, M.D., F.A.C.S. completed a surgical residency in the U.S. Army and then spent three years in the Medical Corps as a general surgeon. Thirty years of private practice later, he retired to begin a new career as a writer. For the last twenty-eight years, he has called North Carolina home. How Little We Know is his seventh novel.